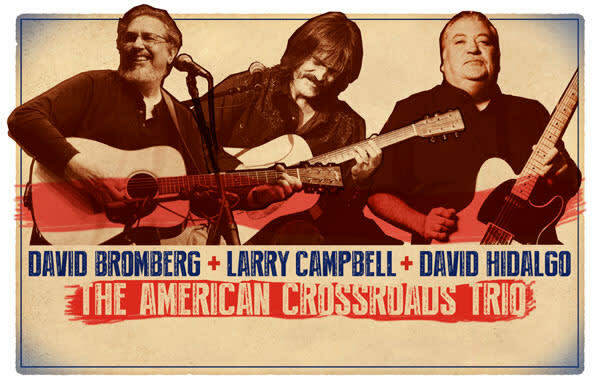 David Bromberg + Larry Campbell + David Hidalgo: "E Pluribus Unum"
Tickets cost $37, $42 and $47 (plus applicable service charges). Tickets are available from the NHCC Box Office (in person and by phone - (505) 724-4771). 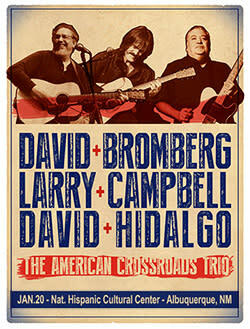 It may seem lofty to use the motto of the United States to describe a musical group, but "out of many, one" accurately describes the trio of David Bromberg, Larry Campbell and David Hidalgo. Each of these acclaimed performers is steeped in American music traditions, from wildly divergent paths. David Bromberg haunted the streets of Greenwich Village in the 1960's, learning the blues first hand from Rev. Gary Davis and Mississippi John Hurt on his way to becoming an in-demand session musician and accompanist for Jerry Jeff Walker, Bob Dylan, Phoebe Snow, Willie Nelson and dozens more. Further musical explorations with Doc Watson and others lead to a deep dive into American bluegrass and country music. David's unannounced performance before 400,000 at the Isle of Wight Festival in 1970 launched a legendary career as a recording artist and bandleader in his own right. David Hidalgo is perhaps best known as the guitarist and singer of the Grammy-winning band Los Lobos, the East LA based group he co-founded with Louie Perez. ‘Lobos' has prospered over a storied forty-five year career, introducing audiences around the world to its unique Chicano-flavored American rock and roll, blues and roots music. Adept at a dizzying arsenal of instruments, Hidalgo is a masterful musician and singer who has contributed to recordings by Bob Dylan, Eric Clapton, Elvis Costello and Tom Waits and others. His unrivaled musicality and vision enables him to adapt to virtually any setting. Larry Campbell, like Bromberg and Hidalgo, has lent his considerable talents to the aforementioned Mr. Dylan—Larry was by Bob's side for eight years as a part of the "Never-Ending Tour" band. Painstakingly teaching himself multiple instruments as a teen, Larry criss-crossed the US soaking up music in Austin, TX, Jackson, MS and Los Angeles. Studio recordings and tours with Keith Richards, k.d. lang, Jackson Browne, Emmylou Harris and others have cemented Larry's reputation as a world class musician. A master guitarist, Larry is also accomplished on mandolin, lap steel, fiddle, pedal-steel guitar, cittern and banjo. 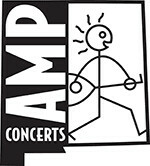 Campbell is a three-time Grammy winner for his productions of Levon Helm. He currently records and tours with Teresa Williams.